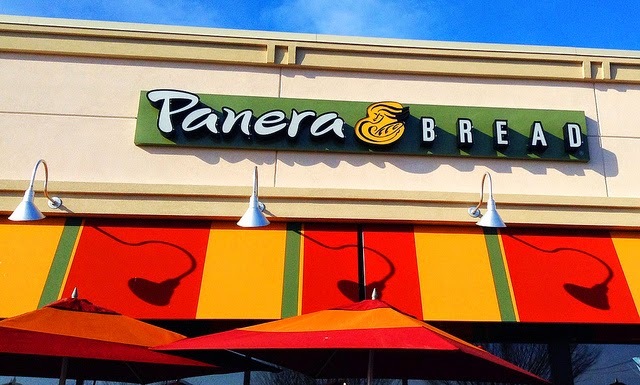 Balancing Jane: Panera's "One-Hour Rule" For Who? 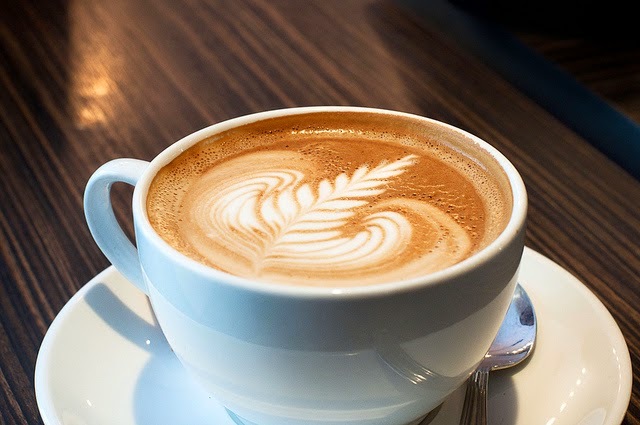 Like a good little doctoral student, I woke up at 6 this morning, got dressed in my comfiest sweat pants, and walked thirty minutes to the coffee shop in order to work on my dissertation for a few hours before the rest of my family got up. One of my normal work spaces is the St. Louis Bread Company (Panera, for those of you outside the St. Louis area, "Bread Co" for those of you inside it) near my house. But today I was meeting a friend who lived closer to a different Bread Co location (the one in Soulard), so we decided to meet there. It was my first time visiting here. I walked in about 7:20 and immediately ordered a bagel with cream cheese and a yogurt parfait, found my seat, got my computer out, and waited for my friend. I sat near the back in a booth, and behind me was an older black man who had plastic bags containing food from outside the restaurant. He appeared to be homeless. The man said good morning to me, and he was sort of wandering around the restaurant for a while. When I first came in, I noticed there was a security guard, which I found a little odd. This same security guard came and confronted the man a little while later. I didn't hear the entire conversation, but I did hear the guard tell him "you're disturbing the customers." The man loudly replied, "I'm not disturbing anybody! I'm just sitting here!" As they walked past me, I heard the man indignantly yell, "I've got money in my pockets! I can buy anything in this store if I want to!" The guard escorted him to the door, and he left. I thought it was a little sad. The man didn't seem to be bothering anybody (and he certainly wasn't bothering me). I couldn't tell if someone had complained about him, but I did think to myself that he was clearly loitering with outside food, so that was probably the problem. About fifteen minutes after that (forty minutes after I first arrived), the security guard came up to our table and asked me, "Ma'am, are you aware of the one-hour rule?" I give him a puzzled look, "The what?" He explains, "You have to make a purchase every hour to take up a table." I narrow my eyes, thinking about the two items I've already purchased and how I would have split them up over time if I'd been aware of that policy in order to get the two hours I needed. "Why isn't there a sign?" I asked. He told me he didn't know and that I'd have to ask the management. Then he asked me if I'd purchased anything yet. I indignantly motioned to my half-eaten parfait and listed off the purchases I'd made. So I went to management. I went to the counter and a young white woman asked if she could help me. I told her I needed to speak to someone, and she came closer. "Why isn't there a sign about the one-hour policy?" I asked. She responded by saying that people couldn't take up tables without making purchases and she hadn't seen me purchase anything (so I assume she sent the security guard to confront me). I explained that I had purchased multiple items and had been there only forty minutes, so her confrontation was completely unwarranted and that if there was a one-hour policy, it needed to be clearly posted so that customers could better plan their purchases to be in compliance. I was starting to get frustrated. She apologized, and tried to explain her suspicion of me. "I've never seen you before, and I didn't know who you were." I am now flabbergasted, "This is my first time at this location. I was meeting a friend, but don't worry, you won't be seeing me again." My voice was rising. "Ma'am, can we please not do this here," she motioned to the line of people making purchases who had stopped to watch our conversation. "Let's talk in private." I storm back to my seat, preparing to leave, telling my friend I'm going to go. The woman gets very apologetic and the security guard joins us. "Ma'am please understand. Because of our location and the homeless situation here, I have to have this policy. I've had people shaving in the bathroom. It's not meant for you. This is a new security guard. He made a mistake. You can stay as long as you'd like." I was now even more angry. I was reading between the lines: "This policy is for poor people--not for students with laptops. The security guard made a mistake by using it on you instead of who it was meant for." I continued to argue that if that was the policy, it needed to be clearly stated. She continued to apologize and say that it wasn't a policy for me. I realized she wasn't hearing what I was saying, and she became desperate as she said, "I've apologized. What more do you want me to do?" And the answer is there was nothing more I wanted her to do. She had made it clear that there was no real one-hour policy. In fact, there was a table of six young men sitting and slowly sipping coffees as they talked about a book for well over an hour. The one-hour policy wasn't written on the wall because then it might scare off customers. It was an unstated policy that only applied to the members of society considered unacceptable for her space. The new security guard had simply made the mistake of not reading the classism and racism in her rules and thinking he should actually enforce them across the board. I ended up staying and finishing my work, but I won't be back to this location. 1) The Bread Co I normally frequent also has a pretty visible homeless presence. I'm frequently solicited for change as I enter and leave the premises, and there have been many times where I've seen people who appear homeless come in and use the restroom or sit in the booths without making a purchase. I've never seen anyone escorted out of the building who wasn't causing a disturbance. 2) There was a sign on the door of the Soulard location that said "No public restrooms. Restrooms for paying customers only." This is not an uncommon sign, and I understand its purpose (especially since this location is right next to an entertainment district and the site of the huge Mardi Gras parade). What caught my attention was the "No public restroom" part. Just because I am a paying customer does not mean I cease to be part of the "public." This coupled with the woman's insistence that I was suspect because she'd never seen me before is particularly baffling. I was a new customer in a public space. I don't have an obligation to personally introduce myself to the manager before making a purchase. If she wants to serve only people she knows in a private space, she needs to stay home. 3) This interaction and policy as a whole is very out of line with St. Louis Bread Company's public ethos. It's this last point I want to discuss a little further. These cafes operate on a pay-what-you-can model and depend on your donations and support to ensure our sustainability. Panera Cares cafes provide suggested donation amounts for all menu items to help you understand the cost of “paying it forward” and assisting those who struggle with food insecurity. The funds collected are used to cover the operating costs of the cafes while also covering the cost of the meals for those who come in and are unable to contribute the suggested donation amount for their meals. The pilot run of this model (which has sparked others in Dearborn, Portland, and Boston) is in St. Louis. . . kind of. It's actually in Clayton, MO, an affluent St. Louis suburb. I remember when this store first opened in 2010, getting tons of positive media attention for its generosity and humane spirit. That's a noble goal, and I want to believe in its sincerity, but I can't help but notice a few things. I don't know what neighborhoods are like for the non-Missouri Panera Cares locations, but the one in the St. Louis is located in one of the richest communities in the area. The homeless population there is considerably less visible (and ostensibly smaller) than the one near the Soulard location, which is next to Downtown. Since the model depends on some customers choosing to pay more than the actual cost to help "pay it forward" to the less economically stable customers, it makes sense to ensure that you'll have richer customers around. But it's also true that this location selection allows the positive press for a single affluent location without having to address the more serious realities of homelessness and poverty in other locations. Whatever the motivation behind the location, the model has not expanded beyond this store in the five years since it began. An attempt to expand the concept on a smaller scale (by choosing a single item on the menu that would operate under the pay-as-you-can model) failed. And I've got to tell you, that ethos of community care and humanity was definitely not present in the store I visited this morning. Is this "one-hour rule" supported (if unstated) company policy? If so, why isn't that rule clearly communicated to customers and enforced fairly and across the board? How do you reconcile this policy and the general atmosphere of the Soulard location with your company's overall ethos and mission statement? Good questions. Looks like I'll have to avoid Panera. I definitely don't want to contribute to a company that would turn away the homeless without equal consideration. Disgusting behavior. I want to be fair to the company as a whole and hope this is an isolated policy of this particular location. I sent this post to their corporate Twitter account, and they informed me they are following up. I was at my local Panera in Ohio the other day and saw a woman who had brought in Buffalo Wild Wings with her and set up shop, so to speak, with her laptop. I did not stick around to see if anyone approached her... but I doubt they would.